Despite police efforts, Ashkelon and Gan Yavne are the scene of two new mob assassination attempts. Two violent attacks in southern Israel have been linked to ongoing mob activity in the area. The latest attacks came despite an arrest campaign last week following a car bombing in Ashkelon. 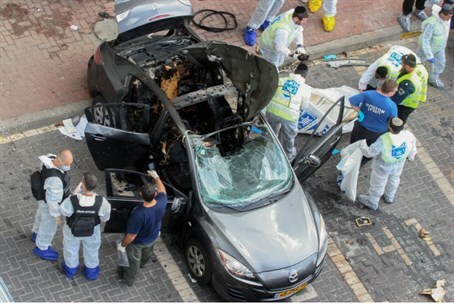 On Saturday, a man was critically wounded in a second car bombing in Ashkelon. Police said the incident was part of an ongoing battle between criminal gangs. Many officers were called to the scene of the blast to investigate. Various regional and national units are involved in helping local officers pursue the case. “This was a very serious incident in which criminal figures endangered human life as part of a conflict between criminals. We will pursue these criminals at all times, in all places,” said Southern District police chief Yoram Halevy. “The long arm of the law will reach everyone who was involved in this serious act, which borders on terrorism,” he continued. The Southern District police force “is not alone,” he added, noting the involvement of elite units and other national forces. Shortly past midnight on Saturday a second assassination attempt was reported in Gan Yavne. A young man was shot and moderately wounded as he left his home in the city. An initial investigation showed that the man was shot by an attacker on a passing motorcycle. The injured man is not cooperating with police.